your interest rate - or both! 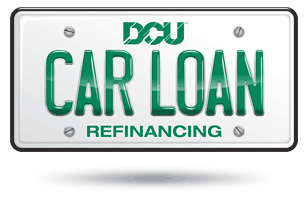 If you love your car, but not your loan, refinancing with DCU could put you back in the driver’s seat with lower rates and flexible terms, including the ability to borrow up to 120% of the car’s value for up to 84 months. Rates listed for new or used cars, trucks, and vans. Qualified borrowers can finance up to 120% of the retail book value. Auto Refinancing is rated 4.8 out of 5 by 5502. Rated 5 out of 5 by Mike from Excellent service and competitive rates! I've been a DCU customer for years. Excellent service and competitive rates will keep me there. Rated 5 out of 5 by Vikram from Awesome produce and great service! Glad to see a great product fulfilled with ease, velocity and grace. Way to go DCU ! Rated 5 out of 5 by Vinod from good support good customer support and faster documents process. Rated 5 out of 5 by Nikhil from It's a good option It's a good option to help the existing Customers. Rated 5 out of 5 by Alaskamemaa from So Easy I have never had anything go so smoothly, or happen so quickly. This is by far the best banking experience I have had. Cudo's to the many people I spoke with when calling in, and thank you so much for all the answers to my questions. Rated 5 out of 5 by Vincent from Great interest rate. Fantastic service and good interest rate. It was easy to apply online and the email service is excellent. Hi, I recently moved to US from India in H1B. I do not have a credit score yet. I am planning to get a car for my daily use. My budget is 5000$ TO 10000$. Please let me know if DCU be able to provide me an auto loan and if so how much can DCU provide me over the price of the car. Hi Arun, You can contact DCU Customer Service with contact details mentioned on website, DCU executive will ask you for the standard details like requirement, Address, Social proof, Offer letter if pay stubs are not yet generated. Once you have all the documents, you loan approval and processing will not take more than 5 days. In my case it was disbursed and received by me on third day. Does applying for a 2nd chance auto loan affect your credit score and/or put a hard inquiry on your credit? Any time you request a &quot;loan&quot; from most institution they will hard pull you, even those that say they soft pull, eventually will make a hard pull upon approving the loans. Some may qualify you with a soft pull but still will do a hard when you go through with the actual loan. Every inquiry and new account will affect your credit because that's just how it is designed by the Bureaus and not set by the banks. Depending on a lot of factors the amount of affect will depends if you have superior credit it may not do much but if you have weak credit it may affect it much more until it ages and you pay on it on time. Hi, I am in US past 10 months on my H1 and getting decent pay and my salary account with BOA, i am thinking for get used car around 10k and i am able to find used car,however when i tried to get loan from BOA, they rejected loan and i am sure it will effect to credit history and I have decent credit score 677 not bad for 10 months old person in US i believe, now please let me know if i get autoloan in from DCU. First, do not disclose your credit score to anyone except banks or authorised places. This score Is not to be disclosed in such forums. You can call dcu customer care and speak to loan expert officers and they will help. They are very polite and helpful to explain in details about the product and Answer your queries. Can I refinance a loan that is funded by DCU? My original loan is funded by DCU at a higher rate. Can i refinance and take advantage of a new lower rate? Is there any limit to how old a car can be to get a second chance loan? There is no limit, but DCU checks the history of the car that you wish to buy before issuing loan amount.